Dennis has been a Realtor for seven years. He got into the work after retiring as a Vice President at IBM. He especially enjoys working with first-time homebuyers — many the same age as his adult kids — because he likes mentoring them and ensuring they’re making smart decisions. Biggest benefit of using the books: "It’s instant credibility…[When] I was with IBM, we had instant credibility. I could go wherever I wanted to. And this is the same kind of thing. It doesn't have the branding recognition, but it helps build your individual brand because people respond to these books." He also says the books are "one of the only things I found that actually works." 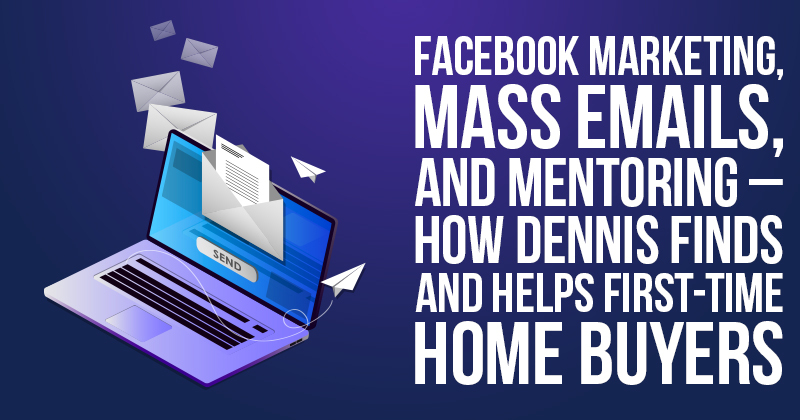 Dennis does Facebook marketing (including remarketing) and posts videos, and he’s really happy with how Facebook works out for him. He plans on continuing to advertise on there, promoting both the blog and an offer for a free book. Dennis has also given out books to what he calls his “sphere of influence,” which is about 800 people he got from Zillow and Realtor.com leads. He sent them all a marketing email that included an offer for a free book. "And I got a bunch of requests. I was surprised because I, you know, advertising can be iffy. So I sent out a bunch of books, and I got two listings and a couple of buyers...Now, these were people that were looking to buy or looking to sell extensively within the last two years. I think that had a lot to do with it. A lot of times, you get these leads in and they're not ready to buy, and they're not ready to sell, they're just, you know, clicking on something on the internet." "As long as you keep them in a database — and I've got statistics — I sell more houses to people in the second year than in the first year that they've actually put in an inquiry. So, you know, you just gotta keep in touch with them." Dennis has found positive responses to his marketing that includes the book offers. In addition to many people requesting books, two people wanted to look for a house right off the bat — they didn’t even want books. Dennis likes that the books make it easier for him to do his job. He says they’ve increased his conversion rate. In addition to his email, he dropped off 15 books after doing some intensive research looking for more recent expireds. He got one listing from that and didn’t even have to call to follow up — they called him. Dennis also gets his share of referrals — the best kind of client, he says. After Dennis has the initial connection with potential new clients, he has them come into the office. He questions them for about 45 minutes to make sure both he and they fully understand what they want. "The biggest thing I help them with is what are deal breakers, "What do you have to have, and what can't you have? So if somebody says, 'I've got 3 kids; we don't like formal dining rooms; I need a big eat-in kitchen,' and they show up at the house and there's a swimming pool in the backyard, but it's got a tiny kitchen, they say, 'Oh I love this house.' No, you don't. You needed a big kitchen. That's what you told me." I enjoy helping these kids make the right decisions. I think they see that. They say, “Well ,we want to put an offer in on this house,” and I tell them 'No, you can't. They look at me like I've got two heads, and I said no, this is no, this is everything you told me is opposite of what this house is, so you see this shiny little object and you want it. Let's keep moving. So I have that capability I think because I don't need to make a sale today, so that's the biggest thing…I’m not gonna let them do something stupid." "Learn how to advertise on Facebook. It's shocking how many young people don't know how to use Facebook, don't know how to remarket on Facebook, don't know how to set up videos on Facebook. This is not a selling business. It's a prospecting business…You can't go into somebody's house and convince them to buy a house. What you have to find is people who want to buy a house. So it's prospecting business. "They don't understand that. They think that, you know, 'Oh, look at this!' I know about all the zoning requirements, and I know about what you have to do if you put a family room in your basement and the egress requirements. So what? Nobody cares about that. You've gotta find somebody who wants to buy a house. "You [also] gotta develop a sphere of influence." Here’s how Dennis gets his listings. #1. Dennis sends bulk emails to his sphere of influence, which includes people who were looking to buy or sell in the last couple years — leads he got through Zillow and Realtor.com. The email directs them to his blog and a free book offer. #2. Dennis does marketing and remarketing on Facebook. He also posts videos. #3. Dennis has also found success researching more recent expireds and delivering the books to them, although he finds that’s a lot more intensive work than the other forms of prospecting and marketing. Listen to the Interview Audio below for more details on exactly how he does it. Here is a transcript of the interview with Katie and Dennis. Smart Agents: OK, can you hear me OK? Smart Agents: OK, great. So, let's get started. First of all, how long have you been a Realtor? Smart Agents: 7 years, OK. Do you have any specialties, that you, any certain kinds of clients you work with for properties? Dennis: I really like working with first-time homeowners, first-time home buyers. Smart Agents: OK. Why is that your favorite? Dennis: I'm a little older, and I spent, I retired from IBM, and I've always been, I was a vice president for a couple of different divisions and I've always been a mentor. I've got 4 kids, and I do a lot of work with their friends, and I just like ... walking them through the process and making sure that they, that they're getting into the right house. And that they're, you know, making smart decisions. It's just, I'm happy doing that. Smart Agents: Yeah. That's great, they're lucky to have you to help them with that, because not all agents, I'm guessing, are quite as conscientious about that. Smart Agents: So, as far as using the books, how long have you been using them? Dennis: Oh jeepers, only a few months. Smart Agents: OK, and do you know how many listings you've gotten, with their help? Dennis: I've gotten ... I sent them out, I originally sent them out, I've got about 800 people, and I call it my spirit influence, it's just, it's really not. I used to buy Zillow and Realtor.com leads and I've got about 800 leads in a database. And so I sent it out to them, I got two listings, and six potential buyers. Well, now another buyer. I've got two listing out of just sending that book to those 700-800 people. Smart Agents: Oh, wow. That's great, and so did you, how did you go about sending it to them? Like what did you tell them? Did you talk to them first before sending, just curious about the process. Dennis: No, I just, I sent out, my CRM obviously allows me to send out bulk emails with a link, and I renamed the blog so there is, you know what obviously you know what I'm talking about the blog is all the questions answered if you're a buyer or seller and also, it has an offer to request a book. Dennis: And I got a bunch of requests, I was surprised because I, you know, it's, advertising can be iffy. So I sent out a bunch of books, and I got two listings, and a couple of buyers out of that just that initial. Now, these were people that were looking to buy or looking to sell extensively within the last two years. I think that had a lot to do with it. A lot of times, you get these leads in and they're not ready to buy and they're not ready to sell, they're just, you know, clicking on something on the internet. Dennis: As long as you keep them in a database, and I've got statistics, I sell more houses to people in the second year, than in the first year that they've actually put in an inquiry. So you know, you just gotta keep in touch with them. Smart Agents: Yeah ... let's see. So would you say that the books have increased your conversion rate? Dennis: Yes, it's made, it's enabled me to do more by doing less. I'm, like I said, I retired from IBM after being Vice President for a number of years. I'm 66 years old. I could, I can sell more by doing less by using the books. It gives you instant credibility. They are in front of the few, if I was going to come back in the next lifetime. Dennis: I don't want to come back as a real estate agent. I want to come back as somebody that sells stuff to real estate agents. Dennis: Because in a lot of stuff out there, a lot of coaches, a lot of schemes. A lot of this will get you 20 listings in the next six months. A lot of tracks, sales tracks, because we, this industry gets a lot of people who have no sales experience. This is one of the things, one of the things, only things that I've found that actually works. I'm very happy with it. Smart Agents: Great, I'm so happy to hear that. So would you say that's the biggest benefit is just that instant credibility to doing more by doing less? Is there anything else you would add? Dennis: The only thing I would add is that the hardest part, the biggest problem I have, the hardest part getting is finding more ways to distribute the books. Dennis: If I could, I do a lot of Facebook advertising and if you could get these books in more peoples hands it works. Dennis: Like I say, its instant credibility, and that's in any sales business like I say I used to barge in on people, I was with IBM we had instant credibility, I could go wherever I wanted to. Dennis: And this is the same kind of thing, it doesn't have the branding recognition but it helps build your individual brand because people respond to these books. Smart Agents: Yeah. As far as just finding more ways of getting out books, if you look at some past blog posts that we've written with other people we've interviewed for these testimonials, there's some people doing some really creative things and some others are just going up to houses and giving them away. There's a whole variety, so that might just, for your own reference, might be a good place to start to get some other ideas. Dennis: I would do some of them. Some of them are great ideas some of them are very labor intensive. Dennis: Yeah, no I've looked at those. Dennis: You guys do a great job of — I'll just give you an example. I was on there at one time looking at this, go to the expireds that were expired like six months and that's very labor intensive, that's about it. Let me try that. Dennis: So, the one day and it's tough looking up expireds and trying to find out if there listed again, or try to find out if they've been sold. But I got some and I dropped off about a dozen books, maybe 15 books. Just put them in — you had that Christmas special and I got those envelopes, free envelopes, I ordered some extra books, and I dropped off, I think was 15 books, and I got a listing out of it I didn't have to call anybody. They called me. Smart Agents: Oh, that's good. Dennis: So, yeah, yeah. They do a lot of Facebook advertising and I liked, I ran an ad and all that stuff was are you looking for the home of your dreams? If you are, I've written a book to help you. Help you find it. And I got some really good leads out of that now we don't have a lot of inventory up here nobody has a lot of inventory. I got right now more buyers than I can find homes for. Smart Agents: Wow ... Sorry, I'm writing as we talk, so if I pause for a second that's why. You're saying lots of good stuff and I just want I always like to have a backup just in case there's something wrong with the recording. We haven't had issues yet, but. Smart Agents: OK... OK. So you said you do Facebook marketing what other, are there other kinds of marketing that you do? Dennis: I still buy Realtor.com leads but as soon as that contract is up I'm going to stop that. I've gotten pretty good at re-marketing with Facebook and I do some videos. Facebook is amazing with how they help advertisers and they're so good at it. Dennis: They're just, they've got it down. Dennis: And I'm just going to do more of Facebook advertising[crosstalk 00:10:09] advertising the blog and you know, come get your free book just send me you know, I'll send you a free book. Smart Agents: Yeah and you know, it's so helpful I think to have the free book, I mean who doesn't want a free book that could help them. Dennis: Right, and like I said, my biggest problem right now is figuring out how to give away more books. Dennis: Literally.Without walking up and down the street, which again, like I said I'm semi-retired and I'm just not going to do that. Dennis: You know that's why I spend money on Facebook, but yeah. My biggest problem is figuring out how to give away more books. Smart Agents: OK. Let's see, so what have you found. It sounds like, actually I'm going to change this question. What have you found is the best way to close those deals, to get the buyers to work with you to help them find the homes they need? Dennis: Once they call me or I call them or once we make contact, I get them into the office and I go through the entire process right from what are you looking for, what are you — I go through an entire questioning process and it can take 45 minutes. To understand and help them understand what they want and what they need and the biggest thing, if I help them with is what are deal breakers, what do you have to have and what can't you have. So if somebody says I've got 3 kids, we don't like formal dining rooms, I need a big eat-in kitchen, and they show up at the house and there's a swimming pool in the backyard, but it's got a tiny kitchen, they say oh I love this house. No you don't, you needed a big kitchen. That's what you told me. Dennis: So this is a deal breaker. So again, I've got 4 kids and I enjoy helping these kids make the right decisions. Dennis: I think they see that. They say, ‘Well, we want to put an offer in on this house and I tell them no, you can't.They look at me like I've got two heads, and I said no, this is no, this is everything you told me is opposite of what this house is, so you see this shiny little object and you wanna, let's keep moving. So, I have the capability I think because I don't need to make a sale today, so that's the biggest thing. Dennis: I don't need to make a sale today and I want to help these kids. Smart Agents: Right. That's great I mean, I really, I don't think I've ever heard of a Realtor saying no, you can't buy this because it's wrong for you. So, that's definitely a fresh thing and like you said it sounds like it surprises them and it's a good thing. Dennis: They're all friends of my kids. Dennis: Not all of them, but they're all the same age. Dennis: So I'm not gonna let them do something stupid. Smart Agents: Right. Now do you get referrals then from your kids, from your kids friends, from other clients as well? Dennis: Yes, yeah.... Obviously that's the best client, just there's a lot of real estate agents around a lot of young real estate agents. So they, you know, I get my share but, you know, they've got friends who are real estate agents and sometimes, probably not the best thing to do, but they do it. Smart Agents: Mm-hmm (affirmative). So, let's see what else. Do you have any advice for anyone who's struggling to get listings, or maybe for brand new agents who are just trying to find their footing in this world, in this career? Dennis: Get a mentor, give them part of the commission. Learn how to sell, learn how to, we get people that come into this business because they like houses or they think they like selling houses, we don't sell houses, we prospect for buyers and sellers so you got to learn how to prospect. A lot of the old fashioned ways, you can't call on the phone, nobody answers, I don't answer my phone. Dennis: If I knew you were calling at 4:30, but if a number comes up and it doesn't it isn't associated with a name, I don't answer it. I can't. I would be answering the phone all day. Dennis: So ... call you know you gotta develop a sphere of influence ... and you have to turn ... I think now if I was starting today, if I was 30 years old or 40 years old, or whatever, I would develop a niche. Or niche, whatever you want to call it. Dennis: I would just work with veterans, I would just work with first-time home buyers. I would gain a reputation as the best person to work with if you're a veteran. You can't be a generalist ... and learn how to use social media. Learn how to advertise on Facebook, I'm the chairman of the technology committee up here. It's shocking how many young kids, even young people don't know how to use Facebook, don't know how to re-market on Facebook, don't know how to set up videos on Facebook. This is not a selling business, it's a prospecting business. It's not like if you were selling life insurance you'd go into somebody's house and try to convince them. You can't go into somebody's house and convince them to buy a house. What you have to find is people who want to buy a house. So it's prospecting business. Dennis: They don't understand that, they think that, you know, oh look at this, I know about all the zoning requirements and I know about what you have to do if you put a family room in your basement and the egress requirements, so what. Nobody cares about that, you've gotta find somebody who wants to buy a house. Dennis: And the books make it easy. The books make it easy. Smart Agents: Good. OK, let's see if I have any other questions... Have there been any surprises since you've started using the books? Dennis: Yeah, what I sent it out to the 800 people in my sphere of prospects, old prospects, new prospects. I had a couple, two people specifically call me that wanted to look for a house. They didn't want the book, and shame on me because I probably hadn't contacted them in a while. Sometimes, you know, why am I calling you, because I want to sell you something. With the books I'm calling you or emailing you because I have something of value to give you. Dennis: So it makes it a hell of a lot easier to send out those emails because now I'm presenting something of value instead of like, do you want to buy a house from me and two of them called me, they didn't want the book, they just said, you know what, we need to start looking for a house. Dennis: Bt it gave me a reason to contact them instead of, jeepers I haven't talked to you in two years. Dennis: Wanna buy something from me? So it was, you have to offer something of value for their you know. That's where it starts. So, I guess it surprised me, but it shouldn't have.